CHICAGO – After the first round of his rematch against Yoel Romero Saturday night at UFC 225, Robert Whittaker went back to his corner for the second straight fight with a serious injury. Whittaker broke his right hand and still had 20 minutes of fight time left with one of the most dangerous pound-for-pound fighters on the planet. In the first matchup, Whittaker suffered a medial ligament injury to his left knee in the first round at UFC 213. He went on to win after digging deep in the championship rounds despite the injury. Australia’s Whittaker did it again in Chicago and after 50 minutes of classic MMA fight time with Romero his star continues to shine bright. The sequel lived up to the original. First things first for Robert Whittaker: after another huge win inside the Octagon comes an unfortunate trip to the injured list to rehabilitate the broken hand. But once the champ is back and healthy, a host of new contenders will be waiting. Former champion Chris Weidman and rising star Kelvin Gastelum attended UFC 225 and both are eager to try their luck against the title holder. Plus, Luke Rockhold has yet to face Whittaker as he remains in limbo between 185 and a potential move up to 205 pounds. Colby Covington has rapidly become the most polarizing figure in mixed martial arts. Whether fans love him or hate him, “Chaos” has everybody talking about him and his massive win against Rafael Dos Anjos. Questions surrounded Covington’s bid for the interim welterweight strap, but he answered them all emphatically with a convincing win over the former lightweight king. Covington’s pace and cardio is off the charts and he forced RDA to work for 25 minutes and did enough in the end to capture the decision. Now the plot thickens as Covington turns his attention toward the champion and former training partner at American Top Team Tyron Woodley. The two have already exchanged pleasantries and that heated title matchup is going to be popcorn-worthy later this year. In case anybody forgot about the talented Holly Holm in recent times, “The Preacher’s Daughter” reminded everyone that she’s still a big factor in two women’s weight classes in the UFC. Holm now has options after her dominant decision win against UFC debutant Megan Anderson, who was outclassed by the former bantamweight champion. Holm could go back down to 135 and take on Amanda Nunes in an interesting title matchup between the two women that took out Ronda Rousey. If she stays at 145, Holm likely will pursue a rematch with Cris Cyborg after taking her the distance late in 2017. He fought valiantly against Mike Jackson to open the Pay Per View on home turf, but CM Punk couldn’t get the win he was seeking at UFC 225. After two years off rebuilding from a disappointing debut, the former WWE superstar showed improvement in his second outing. UFC president Dana White lauded Punk’s effort but admitted it will likely be the last go for Punk in the UFC. Punk’s greatest accomplishment in his transition to fighting may be the passion and determination he brought to the pursuit of competition. Some may have quit after the first one didn’t go his way, but Chicago’s Punk got up, dusted himself off and have it another go. Curtis Blaydes has been on quite the run and has garnered plenty of praise as a rising prospect in a division desperate for new blood. 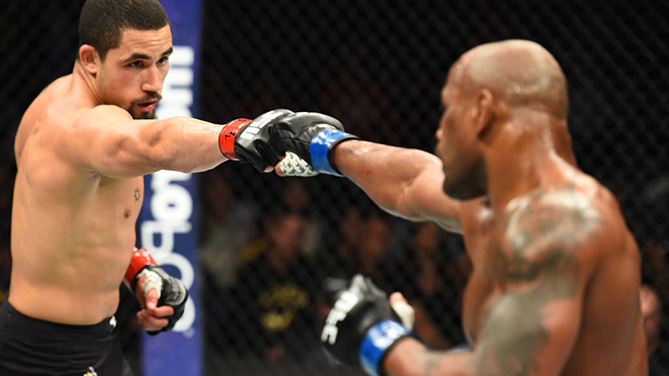 “Razor” cemented his status as a rising contender with a brutal elbow-filled stoppage of Alistair Overeem. Tai Tuivasa received his toughest test to date from veteran Andrei Arlovski, but he was game and worked his way to an impressive decision win. The fight might have won Fight of the Night had it not taken place the same eve as Whittaker-Romero 2. With the super fight title showdown between Stipe Miocic and Daniel Cormier on tap next month – along with the grudge match between top contenders Francis Ngannou and Derrick Lewis – 2018 may just be the year the heavyweight division returned to the top of the conversation in the MMA world.